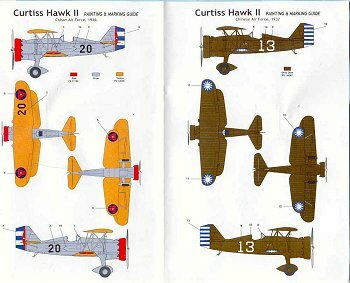 One of the two most important lines of single-seat fighting biplanes produced in the United States during the 1920s and 1930s were the series of Curtiss fighters known as the "Hawk," which were produced for both the Army and Navy, as well as for export to foreign air forces. With the arrival on the scene of the Hawks and their competitors, the Boeing P-12/F4B series, U.S. fighters were finally world-class, fully the equal in capability of any other fighter being produced elsewhere. 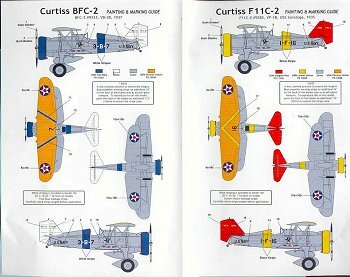 Unfortunately for Curtiss, they let the slow pace of aeronautical development between 1925-33 lull them into continuing to develop a line of airplanes that had become obsolete, rather than moving on as Boeing had with the P-26. This same problem would plague the company with the P-36/P-40 series, which should have been dropped from production after the P-40C. Ultimately, this failure to stay at the cutting edge of design and development meant that Curtiss would no longer be making airplanes after 1945. The Hawk was a good airplane in its day, and saw more combat in obscure wars than many of its contemporaries, fighting in South America, China and Thailand, with good records against difficult opponents. The name "Hawk" was never officially adopted by either the Army or Navy, though it was used by Curtiss throughout the life of the airplane, and then carried on into the P-36 and P-40 series. The last of the series was the "Goshawk," which saw service in the U.S. Navy as the F-11C-2 and BFC-2, and in South America, China and Thailand as the Hawk II export fighter; the major difference between the types was the lack of carrier gear in the export fighter, different cowlings and exhaust systems. The "Goshawk" was a retrograde step in the development of the series, inasmuch as the design reverted to wooden wings and tail, and fabric-covered surfaces, after Curtiss had moved to metal construction with the P-6 and the Sparrowhawk. 28 F-11C-2 Goshawks were delivered to the Navy, commencing in March 1933, and fleet service was with the "High Hats," at the time VF-1B, aboard the U.S.S. "Saratoga." At first, the unit flew a mixed group of Boeing F4B-3s and Curtiss F-11C-2s. In spite of their increased weight, power and speed, compared to the F6C series of Hawks, these Goshawks retained the same pleasant handling characteristics of their predecessors. They would be flown by the High Hats for five years, through three squadron designations - a record for an airplane of the interwar period. In 1934, the airplane was modified with a higher turtleback supplied as a field modification, and the designation changed to BFC-2 - reflecting a primary assignment as a bomber; the squadron changed to VB-2B - following the fleet reorganization of 1937, in which squadrons operating from carriers took the same number as the ship, VB-2B became VB-3 and continued to use the Goshawk until it was replaced by the SB2U-1 "Vindicator" in 1938. The airplane was the first vertical dive bomber used by the Navy, and was instrumental in developing tactics that would be used to great effect in the coming conflict. 125 Hawk IIs were delivered to nine countries between 1932 and 1935. The airplane first saw combat upon arrival in Bolivia, where it formed the Bolivian's fighter arm in the Chaco War with Paraguay, Latin America's last major international war. 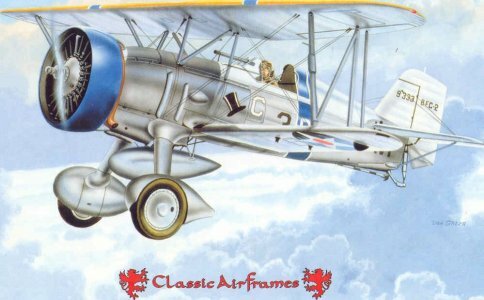 Though used primarily for ground support, some of the 9 Hawk IIs also scored aerial victories at the hands of the British and American mercenary pilots; only three were left when the war finally ended in 1935. 50 were purchased by China in 1933, and flew in combat during the "Manchurian Incident." Their performance edge over the Japanese Army's Ki.10 and the Navy's A4N was directly responsible for the two services spurring development of the next generation of Japanese fighters, the Ki.27 and A5M monoplanes. The 12 sold to Thailand in 1934 would see combat alongside Hawk IIIs in the war against the Vichy French in 1940. 4 Hawk IIs were purchased by Cuba in 1934. In 1936, Len Povey - at that time the American commander of the Cuban Air Force - demonstrated a daring aerobatic maneuver at that year's Miami Air Races that became known as the "Cuban Eight" and has been a staple of airshow performers ever since. Your reviewer once experienced this maneuver while riding in the back seat of a P-51 flown by airshow pilot John Herlihy and can attest to the fact that it will leave one more breathless than any rollercoaster ride. Two Hawk IIs were purchased by the German government at the behest of Ernst Udet, and became perhaps the most important Hawks sold anywhere, as they were used for development of dive bombing tactics for the then-secret Luftwaffe that would result in the development of the Ju-87 Stuka, which changed the face of warfare when used over Poland, France and the Low Countries in 1939-40. The only F-11C-2 models previously available were a very inaccurate model from Lindberg that is so old I can remember making it when I was in junior high school, and a still quite nice 1/72 kit released by Monogram in the early 1970s that has been long out of production and available only through collectors. 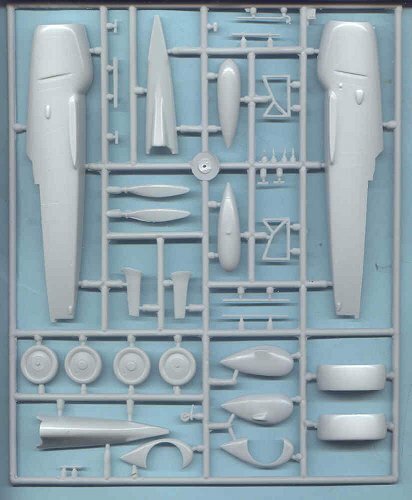 The two current kits are virtually synonymous, with injection molded parts on two sprues of light grey plastic, a bag of resin detail parts for the cockpit and engine (a one-piece affair this time), and a decal sheet covering two different airplanes. The kits differ in that the F-11C-2/BFC-2 has a choice of upper rear fuselages to change the configuration between the two designations, a wider-chord Townend ring than the Hawk II, differing resin exhausts, and different wheels - those for the Navy fighter being high-pressure carrier wheels while those on the Hawk II are low-pressure wheels for operating from grass fields. 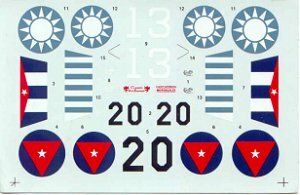 Decals for the Navy airplane are of an F-11C-2 flown by VF-1B, and a BFC-2 flown by VB-3, while those for the Hawk II are for a Cuban airplane and one serving in the Chinese Air Force. 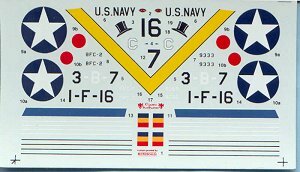 These are Micro-Scale decals and look very good indeed. 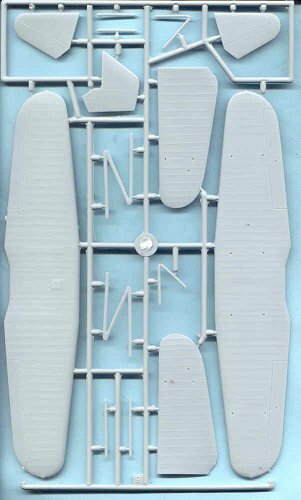 Overall, the moldings are what one expects from a limited-run kit, though the two one-piece lower wings are not warped as were the same parts in the earlier BF2C-1 kit. 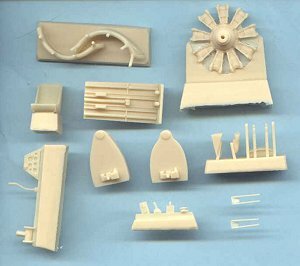 The struts in these kits are also the right size; for the first time in building a Classic airplanes biplane, one is not forced to test-fit the struts with the wings and trim them. The one-piece resin engine is much easier to deal with than the previous method of providing the crankcase and the cylinders as separate moldings. 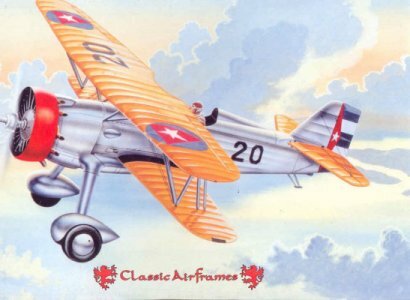 For those modelers who enjoy the airplanes of the inter-war "Golden Age," these two Hawks are a welcome addition to the limited number of kits available for airplanes from this period. The F-11C-2/BFC-2 is guaranteed to look good sitting next to the Classic Airframes Boeing F4B-4 and the Accurate Miniatures F3F-1 and F3F-2.